We are a leading Manufacturer of stainless steel air curtains for malls from Mohali, India. Stainless Steel Air Curtains is a modern device which, when installed on a door, forms an invisible curtain of continuous air and thus prevents escape of conditioned air as well as entry of outside hot, humid and polluted air. Stainless steel air curtain thus not only cuts down your electricity bill, but also helps in maintaining cleanliness and hygiene up to the required standard. 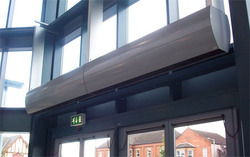 Looking for Stainless Steel Air Curtains for Malls ?